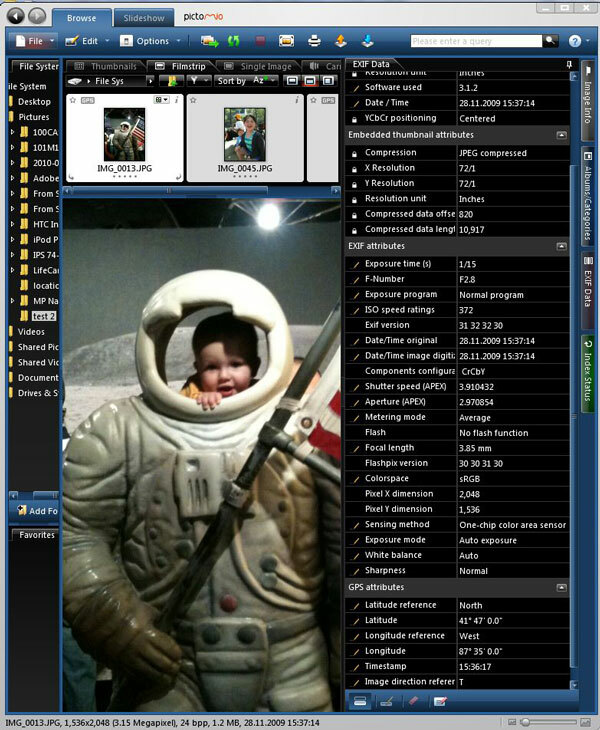 Click on this screen shot of PictoMio for a larger image. Every time you take a photo with your cell phone, there’s a good chance your location is being stored along with the photo. Cell phones with GPS often default to storing this information when GPS is turned on. And some point-and-shoot and dSLR cameras also have GPS built into them. For the most part, this information is helpful for remembering where you traveled and making photo books of your vacation. But if you post your photos on a photo sharing account or a public blog, this same GPS-based data could also lead people to your home, your place of work or even your child’s school. If this makes you feel uncomfortable, it’s easy to take back control over your privacy. For future photos, simply turn off the GPS location storage in the camera settings of your cell phone or camera. In the meantime, you may want to remove the location data from your existing photos. There are a couple of ways to remove the location information from your photos. First, you can download a simple program that strips out the EXIF data. For Windows PCs, try Easy Exif Delete (free on cnet.com) or iPhoto Exif Cleaner for Mac (free on cnet.com) for Macs. These programs will indiscriminately remove all of the EXIF data. For more serious photographers, EXIF data can be valuable. In addition to time and place, you can look up the equipment that was used to take the photos and the settings that were used to take the shot, including flash, focal length, exposure time and ISO, among others. So if you want to retain that information, you can use programs to selectively delete just the location information. There’s PhotoLinker ($49.95 after free 30 day trial on earlyinnovations.com) for Macs and PictoMio (free on pictomio.com) for Windows PCs. Hi, Thanks for the awareness. I will set the GPS Tag off going forward. For those who use android phone you can go to camera setting and off the GPS Tag function. It is good to keep your privacy at the highest level.